Guarantee your compliance! Employers are responsible for protecting employees’ rights and ensuring posting compliance. 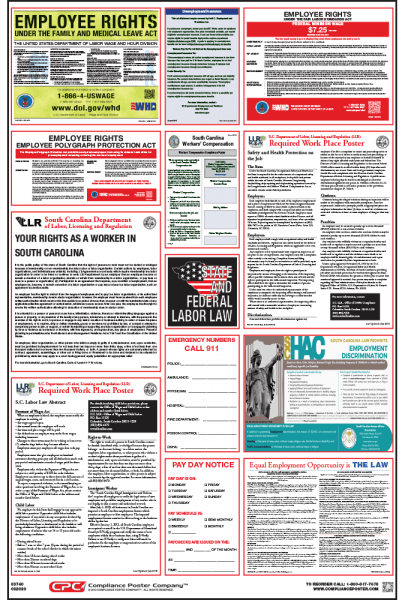 The South Carolina All-On-One™ Labor Law Poster fulfills all State, Federal and OSHA mandatory-to-post requirements for your workplace. Federal and State laws require employers to post notices informing employees of their rights and protections while performing work for their employers. 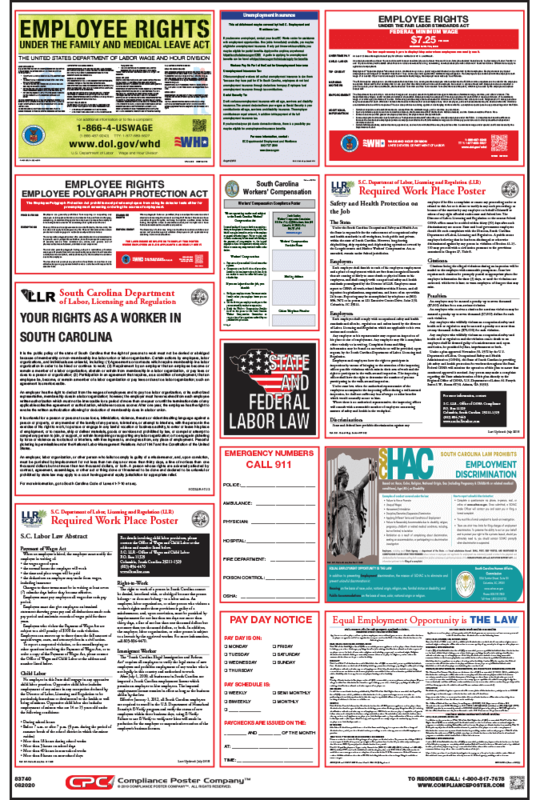 South Carolina Labor Law Posters contain each of the state and federal mandatory labor law notices that must be posted in the workplace. Employers may also be required to post a separate city or county poster depending on their location, or specialized posters relating to their industry. Unemployment Insurance (October 2018) – Updated with new online portal web address. South Carolina Prohibits Employment Discrimination (July 2018) – New posting! Notice fulfills the requirements of the new Pregnancy Accommodation Act and applies to private and public employers. Replaces the previous SC Prohibits Discrimination posting which was required only for public employers. Job Safety and Health Protection (July 2018) – Updated with information on SC OSHA reporting requirements. No Smoking Poster: South Carolina law requires signs designating smoking and non-smoking areas to be posted in all public indoor areas which permit smoking, except private offices. Smoking Permitted Poster: South Carolina law requires signs designating smoking and non-smoking areas to be posted in all public indoor areas which permit smoking, except private offices. Search South Carolina products to find mandatory posters for specific industries.